USS Comfort, AH-6, patient capacity 400, entered service in May 44, US Navy-built and operated Hospital Ship, off Los Angeles Harbor, California. 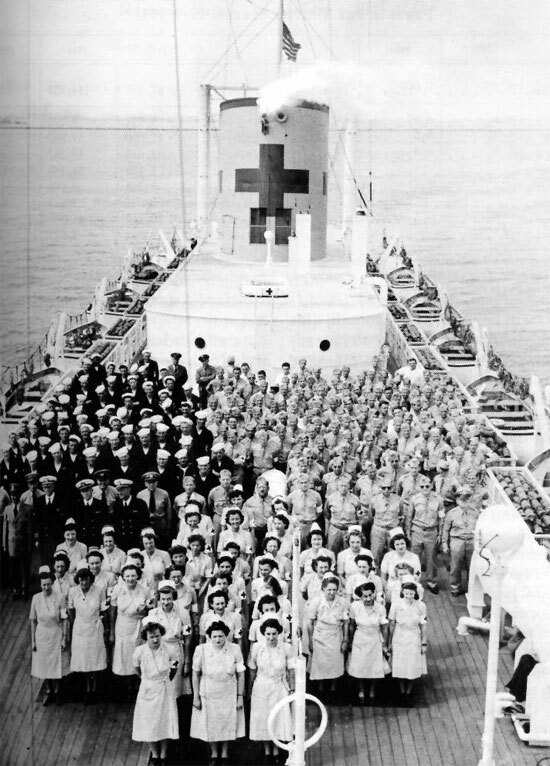 Crew and medical personnel are on deck, prior to their trip to the Pacific Theater via Australia on 21 June 1944. The US Navy operated its first Hospital Ship during the years of the Tripolitan War (1801-1805). In June 1804, a small vessel, in fact a 6-foot ketch named ‘Intrepid’ was fitted as a floating Hospital to receive sick and wounded for medical treatment. The very first official Hospital Ship was a converted six-wheeler vessel, called ‘Red Rover’ which was commissioned on December 26, 1862. During the American Civil War (1861-1865), it continuously sailed the Mississippi River treating almost 3,000 patients from both sides. The US Army converted a passenger line into a kind of floating Ambulance, named ‘Relief’, and used it for a short period during the Spanish-American War (20 April-12 August 1898). During the Great War, Hospital Ships were mainly engaged in transport of sick and wounded military personnel from the Theaters of Operations to Hospital facilities at home. 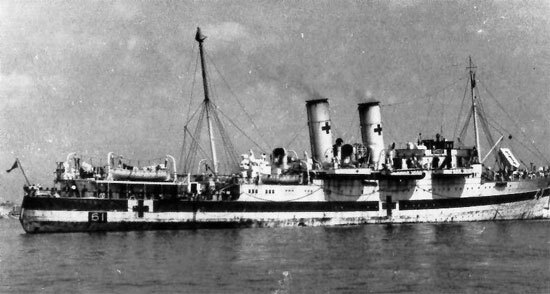 Between November 1918 and March 1919, three US Navy-operated and staffed Hospital Ships, ‘USS Comfort’ (AH-3) – ‘USS Mercy’ (AH-4) – ‘USS Solace’ (AH-2) evacuated patients from Europe to the United States (the Navy was indeed responsible for carrying all wounded, sick, and injured AEF personnel from France to the United States – in WW2, the Army decided it was her responsibility, and she wanted to arrange evacuation with her own ships -ed). 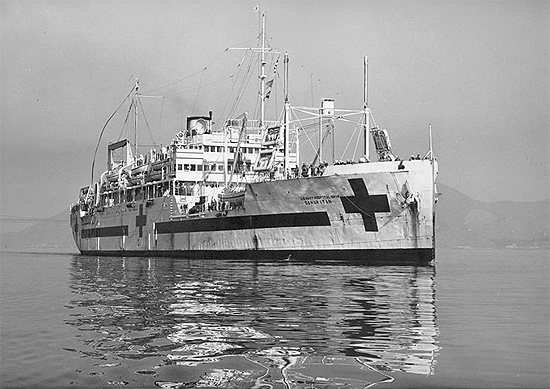 Picture illustrating AHS Maetsuycker (converted Dutch-built liner, operating under Dutch Flag, but registered as an Australian Hospital Ship), which operated in the Southwest Pacific Area. 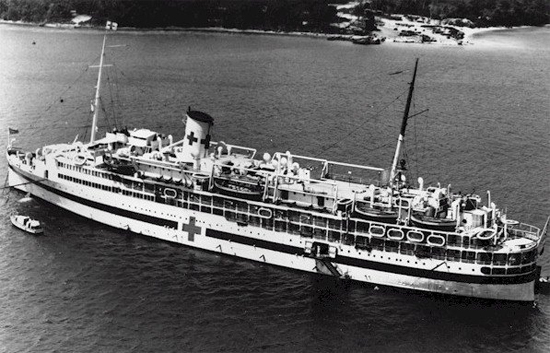 Hospital Ships were painted overall white, with large red crosses, and their hull received a broad green stripe. During WW2, Hospital Ships were again to play a major role in the evacuation of patients from overseas Theaters of Operations. They offered maximum safety, comfort, and medical care, and moreover they were protected by the Geneva Convention! 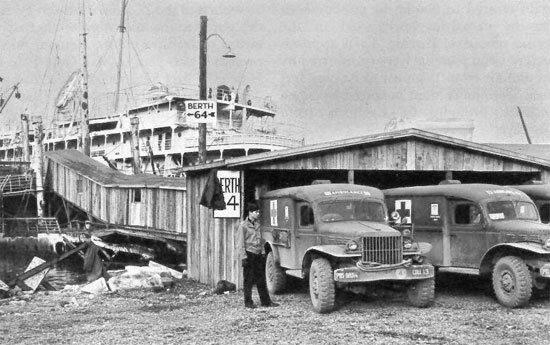 Hospital Ships were manned by civilian crews, employed by the Army Transportation Service, and received a contingent of medical staff provided by the Army’s Medical Department. Most ships were converted passenger liners and cargo or troop ships. The deployment of Army Hospital Ships was determined chiefly by combat operations. The ships were mainly employed in evacuating patients to the United States from North Africa, the Mediterranean Theater, the United Kingdom, continental Europe, the Southwest Pacific and the Western Pacific. They also served for evacuation of patients from forward to rear bases in the MTO and PTO Theaters. Voyage assignments were made by the Chief of Transportation in accordance with reports and lists of patients awaiting evacuation, and estimates of casualties likely to result from impending military operations. 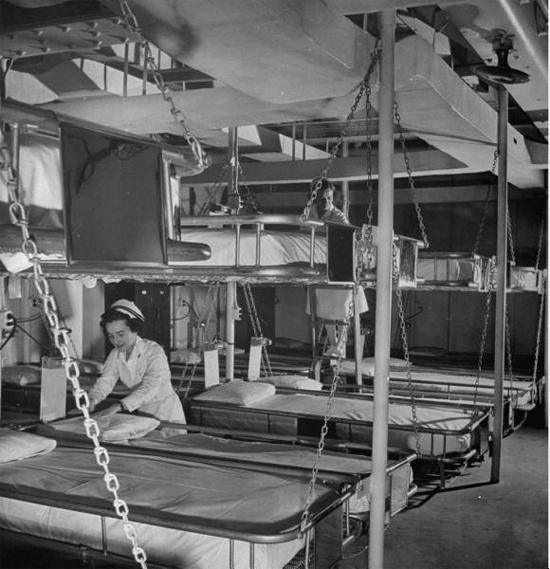 Interior view of the surgical ward of the USAHS Shamrock. 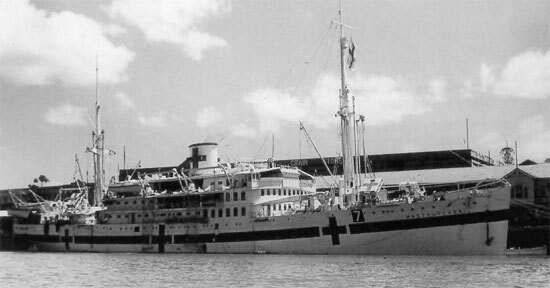 This particular Hospital Ship operated in North Africa (1943) and Southern France (1944). The 24 US Army-operated Hospital Ships made their first journey to the transatlantic Theaters in 1943, later, some were transferred to the Pacific, while others were decommissioned, no longer being needed for evacuation of patients from the European Theater. It must be noted that the first 3 US Navy-operated Hospital Ships ONLY served in the Pacific, and none of these was ever engaged in Europe! In total, the US Navy would operate a fleet of 15 Hospital Ships, and 3 Ambulance Ships. Regardless of the number of Hospital Ships in service, it is important to note that the greater part of patients evacuated by water to the ZI was moved by Troop Transports, i.e. 97% in 1943 – 75% in 1944 – 74% in 1945. 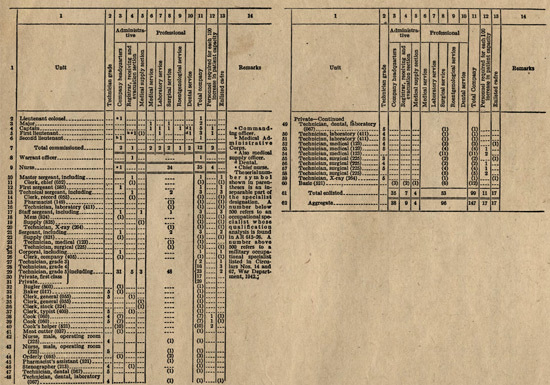 Since the Army had not made adequate plans for wartime evacuation of sick and wounded, early measures to provide Hospital facilities afloat were taken with hesitation; of course it was difficult to forecast requirements, but opinions regarding the extent of their use, their operation, and their number, varied enormously. Regulations were changed in many respects, but finally basic responsibilities were set up: Army Hospitalization and Evacuation were under the general direction of the Commanding General, Army Service Forces (ASF), while The Surgeon General was directly responsible for coordination and completion of evacuation plans and control of bed capacity in ZI General Hospitals, and for making available medical personnel, equipment and supplies for the care of patients, and the Chief of Transportation was responsible for providing adequate shipping (and rail) facilities, scheduling and operating the ships, debarking of patients at US ports, and transfer of patients to either Hospital Trains or Ambulances. Local Commanders of the different Service Commands, staffed and operated the Hospital Cars and Ambulances, used for removal of patients from ports of entry and transportation to the ZI Hospitals. At the beginning of WW2 and during the gradual build-up of United States Forces in the British Isles, transatlantic evacuation from the United Kingdom back to the ZI was still an unresolved issue. In January 1942, the Army requested US$ 36 million for the construction of 6 Hospital Ships. The request was refused by the Bureau of the Budget, on grounds that the Maritime Commission should procure the vessels from its own funds, and stating that such ships came under the cognizance of the Navy (there was also a critical shipping shortage after the Pearl Harbor attack and other priorities)! Studies and numerous discussions with Army and Navy representatives took place, doctrines and policies differed a lot. In May 1942, it was decided to use cargo ship hulls and convert them into Hospital Ships. The JCS then decided to provide 3 vessels through the Maritime Commission to the Army, for conversion to Hospital Ships. Inter-service misunderstandings and rivalry, as well as incomplete specifications, and endless discussions, not only delayed the project, moreover it was even given a low priority! From mid-1942 onwards, the Medical Department advocated a 180-day evacuation policy (the overseas Theater would send home only those patients who were unlikely to return to duty within that time period). This policy was formally authorized in August 1943 for the ETO. Covered ramp to waiting Hospital Ship. View of berth 64 at Leghorn, Italy. PBS (Peninsular Base Section) 883d Medical Collecting Company Ambulances bring in their patients for evacuation by Hospital Ship, from Leghorn to Naples. Picture taken in fall of 1944. In 1942, mental and litter patients only traveled on British or Canadian Hospital Ships, as the United States had no such vessels at their disposal. Ambulatory patients to be returned to the ZI, and who could care for themselves, crossed the Atlantic on returning American Troopships OR British fast liners such as the ‘Queen Mary’ or the ‘Queen Elizabeth’! Between August 1942 and December 1943, the European Theater sent 7,800 patients to the United States by sea. In March 1944, as the number of transatlantic evacuees increased due to the expansion of American Forces and the drive to clear Hospital beds before the planned D-Day operation, the Army obtained temporary WD permission to embark non-ambulatory patients on Troop Transports. There was however a serious risk, as contrary to Hospital Ships, which WERE protected by the Geneva Convention, Troop Ships did not bear specific Geneva Convention symbols, and thus represented legitimate targets for the enemy! Hence the Theater policy would consider sending non-ambulatory cases on plainly marked and regularly operated Hospital Ships only. Hospital Ships could also carry medical supplies and personnel outbound from the United States, without violating international conventions. As stated before, the problem was that in mid-1942, Hospital Ships simply did not exist! There was an Army-Navy dispute over how many Hospital Ships should be obtained, and which service should build and operate them. As a result of these problems, the Joint Chiefs of Staff decided to procure only 3 Army Hospital Ships (General Dwight D. Eisenhower initially had requested 5 ships by April 43). 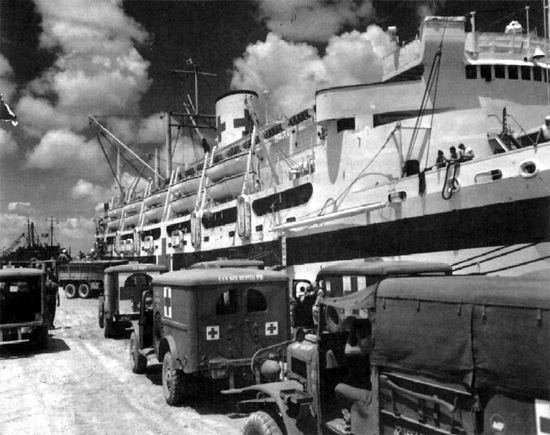 After discussions, meetings, and lobbying from both services (Army and Navy) and based on an analysis of the various military operations, the Chiefs of Staff reviewed their initial decision and now authorized the Army to develop its own fleet of 24 Hospital Ships, with a total capacity of approximately 17,000 patients (most of them were converted from either passenger or cargo vessels, or from freighters or Liberty ships, and some even from troopships). Precious time had however been lost, and as refitting and commissioning went slow (it took 4 months to receive authorization to partially convert a single ship), the first US Army Hospital Ship only reached British waters a short time before the Normandy Invasion. 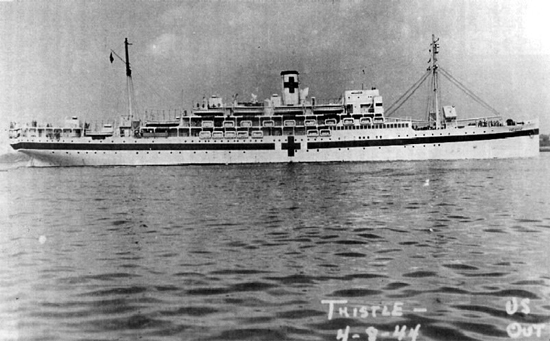 View of USAHS Thistle, converted passenger/cargo ship, 455-bed floating Hospital, leaving Brooklyn, New York, for Gibraltar, Oran (Algeria), and Naples (Italy) 8 April 1944. Continued deliberations, additional requirements, lack of decisions, took their toll, and not much happened. 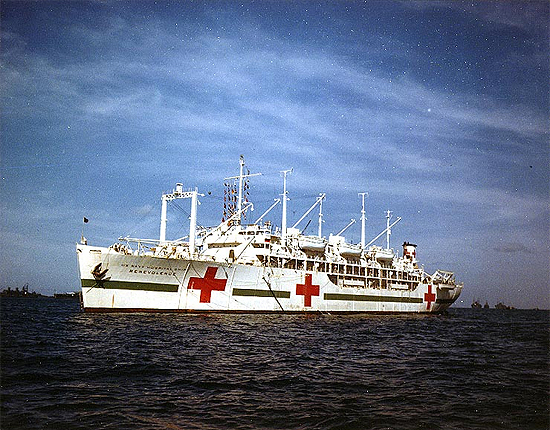 In spring of 1943, The Surgeon General again requested Hospital Ships for evacuation purposes (not to be used as floating hospitals, like the Navy did), and after thorough deliberation, this resulted in a decision to convert two smaller Troopships, the ‘USS Acadia’ (first used as an “Ambulance” Ship in December 1942) and the ‘USS Seminole’ to Hospital Ships, and to register them under the Geneva Convention. The Hospital Ships ordered by the Army (officially designated: US Army Hospital Ship > USAHS), and allowed by the Joint Chiefs of Staff only became available end 1943; they were Army-controlled, but Navy-built, commanded, and operated and were all earmarked for service in the different Theaters (only the medical staff was Army personnel)! 15 more would sail for overseas in 1944, and another 6 would join the Hospital fleet in the first half of 1945; additional planning had contemplated the building of 13 additional ships by 31 December 1943, and 6 more by December 1944, unfortunately the timeframe was never met! Litters ready to receive patients. A US Hospital Ship arrives at Charleston, South Carolina, with a load of patients evacuated from overseas Theaters. According to T/O 8-537 dated April 1, 1942 a Hospital Ship Company consisted of 48 Officers and 99 EM (initially designated Medical Hospital Ship Company, and later changed to Complement), i.e. 12 Officers – 35 Nurses – 1 Warrant Officer – 1 Master Sergeant – 1 First Sergeant – 3 Technical Sergeants – 3 Staff Sergeants – 3 Sergeants – 1 Corporal – and 87 Technicians, i.e. an aggregate of 147 people (based on a capacity of 500). The Hospital Ship unit was subdivided into a Headquarters, a group of Administrative Sections (Registrar-Supply-Chaplain-Chief Nurse-Laundry-Mess), and another group of Professional Sections (Surgical-Medical-Laboratory-Pharmacy-X-Ray-Dental-Receiving & Disposition). Equipment varied according to the size of the complement, and generally included basic unit equipment and 0 to 4 expansion units (based on a 100-bed capacity). All instruments for major surgery, such as operating tables, lamps, autoclaves, inhalation, intravenous, and anesthesia facilities, skeletal tractions, gowns, and masks were stocked on board. Prescriptions, balance, mortar and pestle, graduates, pharmacy, centrifuge, microscope, incubator, refrigerator, dental equipment, laboratory equipment, typewriters, safes, tables, chairs, washing machines, laundry equipment, medical library, drugs, dressings, linen, pajamas, food trays, hot plates, ward cases, bed cradles, medicine cabinets, were all available, except motor vehicles. The ship was a genuine ‘floating’ Hospital. Later, a separate Table of Organization was introduced to cover the Medical Ambulance Ship Company. T/O 8-538 dated 27 October 1942 gave following numbers, 9 Officers – 20 Nurses – 1 Warrant Officer – 76 Enlisted Men, representing an aggregate of 106 people (capacity 500 patients). In comparison to a Company, Separate Hospital Ship Platoons were later introduced with a much lower medical capacity and strength. A Medical Hospital Ship Platoon (Separate) as per T/O 8-534 dated 21 December 1942 only consisted of 5 Officers – 10 Nurses – and 40 Enlisted Men. At the end of June 1945, 332 Medical Hospital Ship Platoons were in service –ed). A revision in fall of 1943 of the respective duties of both the civilian and military crews were agreed by The Surgeon General and the Chief of Transportation, and the Table of Organization for the Hospital Ship Companies was consequently revised. On 7 December 1943, a new version T/O & E 8-537T was published and redesignated Medical Hospital Ship Complement. This particular issue authorized a total strength of 14 Officers – 1 Warrant Officer – 34 Nurses – and 135 Enlisted Men. An updated version of T/O & E 8-537 followed 3 March 1945. At the end of June 1945, a total of 481 Commissioned Officers, 29 Warrant Officers, 1,112 Nurses, and 4,351 Enlisted Men were assigned to Medical Hospital Ship Complements. 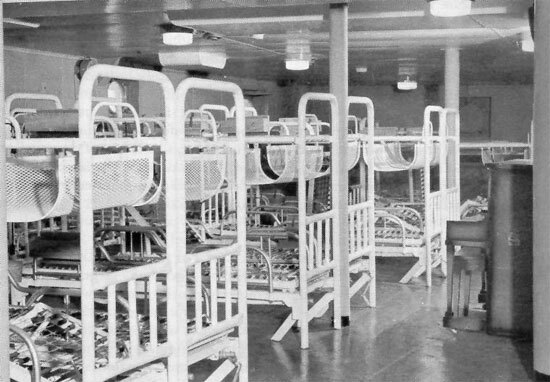 Partial view of one of the medical wards aboard the AH-11 Refuge, former passenger vessel converted to a 626-bed Hospital Ship operated by the Navy. It was briefly put into operation for a transatlantic crossing to Algeria (North Africa) course of April 1944, and made two more trips to Europe, traveling to Belfast and Liverpool in June and July 1944. The USS Refuge departed for Southern France in August and together with Army Hospital Ships shuttled patients from St. Tropez Bay to Naples, Italy. She was one of the only Navy Hospital Ships to operate in the region. In December 1944 the vessel was attached to the Service Force, 7th Fleet, and started operating in the Pacific Theater. T/O 8-534 dated 21 December 1942 was drafted to cover Medical Hospital Ship Platoons (Separate) authorizing a personnel force of 7 Officers – 20 Nurses – 1 Warrant Officer – 60 Enlisted personnel, i.e. a total numberof 88. An amended T/O 8-534 was introduced in 1944, allowing for separate Medical Hospital Ship Platoons consisting of 25, 50, 75, 100, 250, and 500-bed units, with manpower strength varying from approximately 1 Officer & 4 EM (25-bed unit) to 6 Officers & 45 EM (500-bed unit). These units provided medical care for patients being evacuated on regular cargo or transport ships on their return trip to their Port of Embarkation/Debarkation, and were in fact supplementary to the permanently assigned medical personnel on board of the transport vessel. 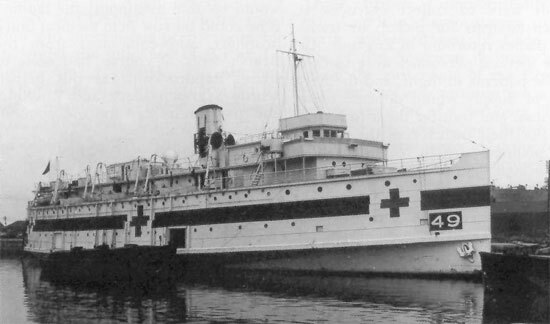 The Hospital Ship could only be used for medical purposes and was therefore painted overall white and marked with the red Geneva Cross. It was to be unarmed and registered with both friendly and enemy powers, in accordance with the provisions of the 1907 Hague Convention. USAHS Frances Y. Slanger, at Brooklyn Shipyards, ZI, where the former transport vessel was converted, early Jun 45. 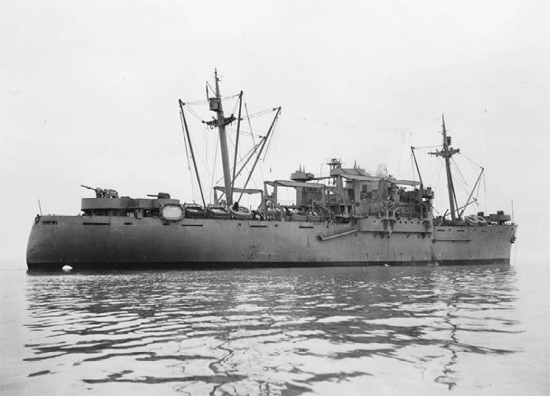 The USAT ex-Saturnia was an Italian vessel, seized from the Italian Government, and later leased by the Wartime Shipping Administration in 1944, which used the ship and crew for troop transportation between the ZI and the ETO. At the end of 1944, the WD decided to convert to ship into a Hospital Ship. It was officially designated a US Army Hospital Ship by WDGO No. 41 dated 23 May 45. 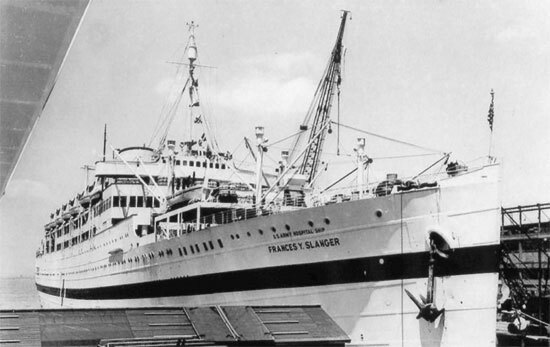 The Francis Y. Slanger had a bed capacity of 1,628 patients and a speed of 19 knots, it left New York P/E on 30 Jun 45 with destination the United Kingdom. After 5 long trips which took her from New York to Southampton and Cherbourg, the ship was taken out of service and decommissioned on 7 Jan 46. Her career was however not over, she was re-converted to a transport ship reverting to her old name ‘USAT Saturnia’ and was used to bring back troops and war brides from Europe to the United States. The ship was returned to the Italian Government late 1946. The very FIRST Army Hospital Ship to sail on its maiden trip, was bound for North Africa, it was the ‘USAHS Acadia’ (sent to Boston for conversion May 29, 1942) which departed on June 5, 1943, to be followed by the ‘USAHS Shamrock’ (departed 4 Sep 43) and the ‘USAHS Seminole’ (departed 20 Sep 43), all with the same destination. 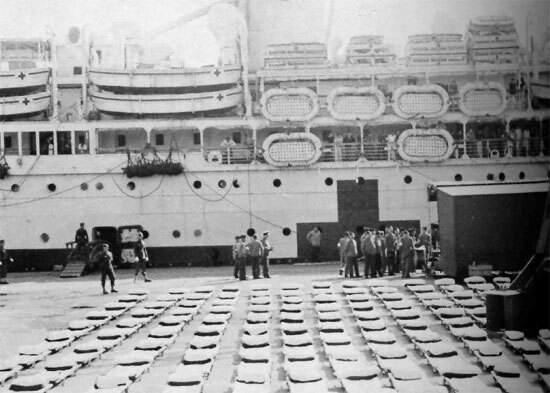 During the early stages of the Tunisian Campaign (17 Nov 42 > 13 May 43) and as previously indicated, litter patients destined for the ZI were evacuated from Algiers and Oran to the United Kingdom on British Hospital Ships, while neuro-psychiatric and ambulatory patients were sent directly to the United States by unescorted Troopships. A total of 20,358 US Army patients were evacuated from N. Africa to the United States during 1943 (481 by British Hospital Ships, 3,593 by US Hospital Ships, 16,284 by US Transport Ships). In North Africa, only British Hospital Ships were involved at first, as no American Hospital Ships were yet available, and transfer from shore to ship, was handled with help of LSTs. During the Invasion of Sicily, both the ‘USAHS Acadia’ and ‘USAHS Seminole’ were on call, with additional support from British Hospital Ships and Carriers, while evacuation from the beaches was again handled by LST. Evacuation from the Anzio Beachhead took place by LST to offshore British and American Hospital Ships and Carriers too. While the ‘USAHS Shamrock’ evacuated the majority of its patients to Oran (Algeria), the ‘Acadia’ and ‘Seminole’ were on site to return the most serious cases to the Zone of Interior. For D-Day, June 1944, Navy shore parties loaded casualties onto LSTs and other vessels for evacuation to England. Fifty-four out of 103 LSTs were converted to accommodate casualties (capacity 144 + 150 litter patients + 100/150 walking wounded). LSTs received ample allowances of battle dressings, morphine, sulfa, whole blood, plasma, and penicillin, and on its outbound voyage each LST carried exchange units of blankets, litters, splints, plasma, and surgical dressings for the French beaches. There was still some apprehension however; indeed the LSTs had no Geneva Convention protection! Between D-Day and D+11, LSTs transported almost 80% of the wounded evacuated from Normandy. 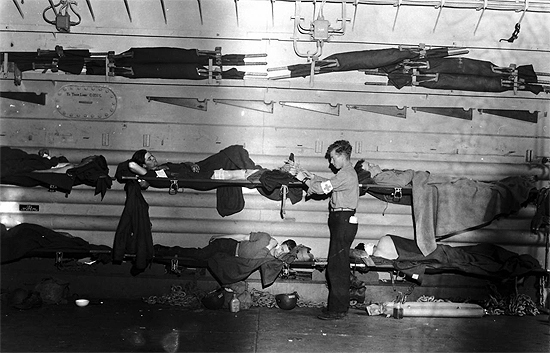 The casualties that were not, or could not be evacuated by LST, crossed the Channel on 4 British Hospital Carriers, i.e. converted ferries and coastal steamers, painted white and bearing Red Crosses (for Geneva Convention protection) which shuttled between Southampton and Utah or Omaha Beaches – they were the ‘Dinard’ (patient capacity 208), the ‘Naushon’ (patient capacity 300), the ‘Lady Connaught’ (patient capacity 341), and the ‘Prague’ (patient capacity 422). Since there were not enough ships to carry all the wounded, American and British authorities negotiated and secured a total of 7 Hospital Carriers and 2 Hospital Ships for the cross-Channel run. Inside view of LST deck modified to hold litter patients. a Navy Corpsman is trying to keep them comfortable. After the landing in Southern France, initial evacuation was by LST to Ajaccio (Corsica), while the most serious cases were flown to Naples by air. On D+1, the first three US Hospital Ships arrived on call of the Seventh United States Army Surgeon, soon to be followed by more vessels, such as the ‘USAHS John L. Clem’, ‘USAHS Acadia’, ‘USAHS Shamrock’, ‘USAHS Thistle’, ‘USAHS Algonquin’, ‘USAHS Château Thierry’, and ‘USAHS Emily H. M. Weder’. In total 12 such vessels would at first operate out of Corsica, afterwards all ships embarked casualties at Ste-Maxime (S. France) and discharged American patients at Naples (Italy) and French patients at Oran (Algeria). As more fixed hospital beds became available with the fall of Marseille and Toulon, evacuation out of France became less necessary. Another change was the beginning of air evacuation on D+7 which greatly reduced the need for Hospital Ships! USAHS St. Olaf, at berth, somwhere in Britain. Originally a Liberty Ship, the St. Olaf was converted in 1942 in Boston on behalf of the US Army Transportation Service (USAT). It was designated Hospital Ship on 24 Feb 44 by the War Department and officially announced by General Order No. 51 dated 19 Jun 44. The ship, with a capacity for 586 patients, and a speed of 11 knots, left New York P/E on 12 Aug 44 with destination the United Kingdom. It was decommissioned by WDGO No. 120 dated 18 Dec 45. After the Battle of the Bulge, and the new and final offensive against Germany, extra patients began overcrowding many Hospitals placing a strain on personnel and bed capacity. Cross-Channel evacuation looked impossible to improve, and sea evacuation to the United States was reaching its maximum capacity. More efforts were now aimed at obtaining additional transatlantic hospital-type accommodations, including enlarging troop capacity of ‘Queen Mary’ and ‘Queen Elizabeth’ liners, and converting 6 additional Troopships to Ambulance vessels. Air evacuation by C-54 transport aircraft achieved a long-promised rate of 2,000 patients per month. Evacuation numbers were now rapidly increasing; 24,666 patients crossed the Atlantic by plane and ship in January 1945, another 29,743 went in February 1945, and 30,410 returned in March 1945 … the ETO Hospitalization and Evacuation crisis was now over; lighter battle casualties and the opening of extra continental General Hospitals produced a steadily growing of bed capacity … but though the crisis had been overcome, the last offensive against Germany would entail more problems, as medical groups became unable to assume their responsibilities – by the end of April 1945, the First United States Army controlled 216 German Military Hospitals, 4 German PW Camps, 22 DP Centers, and 3 RAMP Hospitals; it not only had to deal with combat forces, but also to care for prisoners of war and non-combatants, and arrange for their evacuation. Meanwhile the front moved too rapidly for medical supply to keep pace, and air evacuation brought a partial solution. After May 1945 (V-E Day), patients tagged for quick return home were transported to the 1st General Hospital at Paris, airlifted to the Embarkation Hospitals at Cherbourg and Marseille for return to the United States by sea. After the war had ended in Europe, a number of Hospital Ships were transferred to the Pacific for further service. The USS Comfort, AH-6 (21 Jun 44 – 19 Apr 46) arrives at Hollandia, New Guinea, Dec 44. A US Army Base (Base “G”) was set up at Hollandia, western New Guinea in mid-44 primarily to prepare and support future operations in the Philippines. By 30 Jun 44, the 27th Hosp Cen had been developed, including 4 General, 2 Station, and 1 Field Hospital with an aggregate bed capacity of 3,650, which was increased to 8,930 by Oct 44, and further expanded to 9,502 by spring of 45. After V-J Day, Hospitals Ships which could be released from patient evacuation were to be employed as passenger vessels for repatriation of American servicemen and women, and military dependents. In total 29 Hospital Ships had been authorized for the Army during WW2, but only 24 were in service when the war ended. They represented a total accommodation for 16,755 hospital patients. In addition to this, the Navy, which initially did not plan to operate Hospital Ships under the Geneva Convention, had 15 Hospital Ships at the end of the war. Medical staff necessary to accompany the evacuees were not always available in sufficient numbers, and units did not always match the number of casualties to be transported, eventually Medical Hospital Ship Platoons were standardized on the basis of 1 Medical Officer, 1 Dental Officer, and 15 EM to care for 100 patients (as opposed to 2 Officers, 4 Officers, and 11 EM in April of 1942). (following Hospital Ship Platoons have been identified: 1st – 2d – 3d – 4th – 5th – 6th – 7th – 8th – 9th – 10th – 11th – 15th – 16th – 23d – 26th – 27th – 28th – 29th – 30th – 31st – 32d – 33d – 34th – 35th – 36th – 37th – 38th – 40th – 451st – 452d – 453d – 454th – 466th – 468th – 481st – 485th – 487th – 504th – 506th – 511th – 512th – 520th – 521st – 524th – 528th – 531st – 532d – 533d – 534th – 537th – 539th – 540th – 541st – 542d – 543d – 544th – 546th – 547th – 548th – 549th – 550th – 553d – 554th – 556th – 557th – 558th – 559th – 560th – 562d – 564th – 565th – 568th – 571st – 573d – 576th – 578th – 581st – 584th – 585th – 593d – 597th – 598th – 599th – 601st – 606th – 608th – 609th – 618th – 619th – 620th – 621st – 622d – 623d – 624th – 627th – 630th – 642d – 643d –644th – 647th – 648th – 650th – 663d – 664th – 674th – 675th – 681st – 690th – 697th – 704th – 710th – 712th – 716th – 719th – 733d – 738th – 739th – 748th – 759th – 778th – 785th – 788th – 808th – 821st – 824th – 830th – 832d – 848th – 872d – 874th – 882d – 885th – 905th – 920th – 923d – 926th – 927th – 930th – 975th – 987th). Some of the Medical Hospital Ship Platoons not only served aboard Hospital Ships, but were also involved with providing medical support on board Army and Navy Troopships. They not only served to supplement medical units currently operating aboard ships, but were often temporarily assigned to Army Hospitals in different Theaters. Personnel often received on-the-job training and/or temporarily assisted Army medical units prior to a more definite assignment. One such particular case took place in North Africa. The 56th Station Hospital, the largest hospital in ABS, located in Casablanca, French Morocco, established and opened a special PW enclosure (between 4-14 May 1943 –ed) at Berrichid (approximately 19 miles from Casablanca) to receive and treat huge numbers of German and Italian PWs, mostly captured after the fighting ended in Tunisia (some 20,000 to 28,000 men –ed). The patients were housed in 9 prefabricated buildings and numerous tents. The own personnel was not sufficient to cope with this large influx of prisoner patients and was therefore supplemented by Detachments of 3 Officers – 6 Nurses – and 22 Enlisted Men each belonging to the 34th – 36th – 37th Medical Hospital Ship Platoons. Furthermore, because of the large number of German casualties and the inevitable language barrier, 2 German Army Medical Officers assisted by 100 / 120 German medical orderlies and personnel were on temporary duty at the 56th Station Hospital. Operations at Berrichid ended on 15 August 1943, when the PW camp was closed. Following this period, the 56th set up in an orphanage in Casablanca, where it ran a convalescent camp on behalf of the 6th General Hospital. AH-5 Solace, converted passenger vessel, 450-bed Hospital Ship operated by the Navy, at anchor. The ship was in Pearl Harbor during the Japanese attack on 7 December 1941, but remained unharmed. Medical personnel and part of the crew were on board and helped treat casualties during the attack. The Solace later participated in the following Pacific campaigns: Gilbert and Marshall Islands, the Marianas, the Western Caroline Islands, Iwo Jima, and Okinawa. The list below identifies newly-built Army Hospital Ships and/or converted vessels. The first date reflects the WD designation as a Hospital Ship, followed by the WDGO and date, the name of the vessel, the year built, the speed, the patient capacity, the port of departure, the destination, and finally the date of embarkation. APH-2 Pinckney, Evacuation Transport (sometimes designated Ambulance Ship). After extensive refitting and shakedown, the ship left San Diego with destination the Pacific Theater, where it took part in the WW2 numerous campaigns. During the fighting for Okinawa she was unfortunately hit by a kamikaze plane on 28 April 1945; suffering extensive damage and loss of life, the ship was temporarily repaired and returned to the United States by way of Saipan. She reached San Francisco 8 June 1945 where she docked for a number of months to allow for repairs. The USS Pinckney was ready to sail by end October and made one of her last trips to the Far East carrying replacements and occupation forces to Japan. AH-10 Samaritan, converted troopship, 394-patients Hospital Ship operated by the Navy. Illustration shows subject vessel underway in San Francisco Bay around August 1945, after returning from the Marianas operation (Saipan). It later returned to the Palau Islands (Peleliu), and also took part in the Okinawa and Iwo Jima campaigns. Note: another Hospital Ship was the ‘USAHS Howard A. McCurdy’ (named after the first DC Officer killed in this war –ed), ex-President Tyler, built in 1920, and converted in Boston, Massachusetts. In January 1945, Lt. Colonel Clifford H. Arnold, MC, was ordered to organize the ship’s medical complement. The Officer made his last trip on the USAHS “Acadia” before resuming his duties as CO of the 233d Medical Hospital Ship Complement, some time around May-June 1945. The ship’s conversion was however suspended after V-J Day. This also applied to the ‘USAHS Armin W. Leuschner’, ex-Willard A. Holbrook, built in 1921, and about to be reconverted and refitted at Mobile, Alabama. AH-13 Benevolence, 800-bed floating Hospital operated by the Navy (sister ship of the AH-12 Haven) in the Pacific Theater. After its WW2 assignment the vessel participated in Operation ‘Crossroads’. She is seen here moored amidst the target fleet at Bikini Atoll 13 July 1946. She later successfully traveled to China in 1947, receiving, treating, and transferring numerous patients for return to the States. The US Navy operated 3 so-called Ambulance/Evacuation Transports. They served to transport, evacuate, and return patients from overseas Theaters to the Zone of Interior. As they were armed, they were not protected by the Geneva Convention. Since no American Hospital Ships were available to SHAEF for evacuation operations in the European Theater, Great Britain provided the necessary assistance during the D-Day landings. Four (4) British Hospital Carriers were on loan to the US Navy from Great Britain. They were “Dinard” – “Naushon” – “Lady Connaught” – and “Prague”. There was a fifth vessel, the “St. Julien” which struck a mine on June 7, and was thus unable to take part in the operation. Nevertheless LSTs continued to evacuate patients the first two months of fighting in Normandy transporting them to England. Although cold, damp, and unprotected by the Geneva Convention, the ships clearly demonstrated their effectiveness for moving casualties. View of British Hospital Carrier “Prague”, during one of its cross-Channel evacuation runs. Shuttles ran between Cherbourg and Southampton. Except for 560 patients taken out on assault transports (APAs), the other casualties evacuated by sea traveled on either LSTs or British Hospital Carriers. The Hospital Carriers, converted British ferries or coastal steamers, were equally painted white with large Red Crosses (for Geneva Convention protection). They operated with British crews under the British Ministry of Transportation, and in 3 cases, with US Army medical complements on board (some were increased by adding extra personnel from the Auxiliary Surgical Teams and Hospital Trains). Operations began soon after D-Day, with the carriers shuttling between Southampton and the Normandy beachheads. The ships were safer from enemy attacks; they were heated inside and provided with bunks, and the necessary operating rooms and personnel for handling medical ands surgical cases. They were more comfortable for patients than the LSTs, although they lacked easy boarding facilities (no ramps). Transfers from shore took place by landing craft to the carriers’ own small ‘water’ ambulances (small landing craft). Once aboard the Hospital Carrier, litter cases had to be manhandled from top deck down ladders and narrow passages and transferred from stretchers to bunks, not an easy operation. Most casualties were taken to Southampton (jointly used by American and British forces). At Southampton, the Casualty Reception Center operated with the help of the 93d Medical Gas Treatment Battalion (CO > Colonel Joseph W. Palmer, MC), supported by elements of its own organic companies, as well as 1 Medical Sanitary and 2 Motor Ambulance Companies. After debarkation, the patients were distributed to holding units and transit hospitals. Between 6 > 22 June 1944, over 6,000 wounded disembarked at Southampton. The British relied on Hospital Trains to transport the wounded from the wharves to the transit hospitals, whereas the Americans mainly used ambulances for the first stage of land evacuation. Non-transportable patients were sent to the holding units of the 28th Field and 46th Field Hospitals in Southampton. Picture of British Hospital Carrier “Naushon” (converted American ferryboat with a capacity for 300 patients). Four British Hospital Carriers helped evacuate casualties from the American D-Day beaches. AH-8 Mercy, Navy-operated Hospital Ship with a 400-bed capacity. Docked at Guam in May 1945, after returning with casualties from the Okinawa campaign (this was the second Navy Hospital Ship operating under the name Mercy. Designated AH-4, it brought back home 1,977 patients from France in 1918). The ship participated in many of the Pacific campaigns during World War 2.